You can centrally create, enforce, and log application and network connectivity policies across subscriptions and virtual networks. 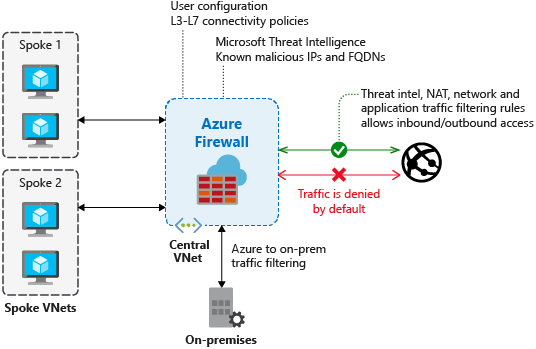 Azure Firewall uses a static public IP address for your virtual network resources allowing outside firewalls to identify traffic originating from your virtual network. The service is fully integrated with Azure Monitor for logging and analytics. High availability is built in, so no additional load balancers are required and there is nothing you need to configure. Azure Firewall can scale up as much as you need to accommodate changing network traffic flows, so you don't need to budget for your peak traffic. You can limit outbound HTTP/S traffic to a specified list of fully qualified domain names (FQDN) including wild cards. This feature does not require SSL termination. You can centrally create allow or deny network filtering rules by source and destination IP address, port, and protocol. Azure Firewall is fully stateful, so it can distinguish legitimate packets for different types of connections. Rules are enforced and logged across multiple subscriptions and virtual networks. FQDN tags make it easy for you to allow well known Azure service network traffic through your firewall. For example, say you want to allow Windows Update network traffic through your firewall. You create an application rule and include the Windows Update tag. Now network traffic from Windows Update can flow through your firewall. A service tag represents a group of IP address prefixes to help minimize complexity for security rule creation. You cannot create your own service tag, nor specify which IP addresses are included within a tag. Microsoft manages the address prefixes encompassed by the service tag, and automatically updates the service tag as addresses change. Threat intelligence-based filtering can be enabled for your firewall to alert and deny traffic from/to known malicious IP addresses and domains. The IP addresses and domains are sourced from the Microsoft Threat Intelligence feed. All outbound virtual network traffic IP addresses are translated to the Azure Firewall public IP (Source Network Address Translation). You can identify and allow traffic originating from your virtual network to remote Internet destinations. Inbound network traffic to your firewall public IP address is translated (Destination Network Address Translation) and filtered to the private IP addresses on your virtual networks. All events are integrated with Azure Monitor, allowing you to archive logs to a storage account, stream events to your Event Hub, or send them to Azure Monitor logs. Conflict with Azure Security Center (ASC) Just-in-Time (JIT) feature If a virtual machine is accessed using JIT, and is in a subnet with a user-defined route that points to Azure Firewall as a default gateway, ASC JIT doesn’t work. This is a result of asymmetric routing – a packet comes in via the virtual machine public IP (JIT opened the access), but the return path is via the firewall, which drops the packet because there is no established session on the firewall. To work around this issue, place the JIT virtual machines on a separate subnet that doesn’t have a user-defined route to the firewall. Network filtering rules for non-TCP/UDP protocols (for example ICMP) don't work for Internet bound traffic Network filtering rules for non-TCP/UDP protocols don’t work with SNAT to your public IP address. Non-TCP/UDP protocols are supported between spoke subnets and VNets. Azure Firewall uses the Standard Load Balancer, which doesn't support SNAT for IP protocols today. We are exploring options to support this scenario in a future release. Missing PowerShell and CLI support for ICMP Azure PowerShell and CLI don’t support ICMP as a valid protocol in network rules. It is still possible to use ICMP as a protocol via the portal and the REST API. We are working to add ICMP in PowerShell and CLI soon. FQDN tags require a protocol: port to be set Application rules with FQDN tags require port:protocol definition. You can use https as the port: protocol value. We are working to make this field optional when FQDN tags are used. Moving a firewall to a different resource group or subscription is not supported Moving a firewall to a different resource group or subscription is not supported. Supporting this functionality is on our road map. To move a firewall to a different resource group or subscription, you must delete the current instance and recreate it in the new resource group or subscription. Port range in network and application rules Ports are limited to 64,000 as high ports are reserved for management and health probes. We are working to relax this limitation. Threat intelligence alerts may get masked Network rules with destination 80/443 for outbound filtering masks threat intelligence alerts when configured to alert only mode. Create outbound filtering for 80/443 using application rules. Or, change the threat intelligence mode to Alert and Deny. Azure Firewall uses Azure DNS only for name resolution Azure Firewall resolves FQDNs using Azure DNS only. A custom DNS server is not supported. There is no impact on DNS resolution on other subnets. We are working to relax this limitation.